Following LG Electronics USA’s announcement last week that it had chosen BroadSign International, Montreal, as the software provider for its newest digital signage solution, SuperSign Premier – geared to make it easier for small and medium-sized businesses to deploy and manage digital signage networks – we talked at length to Jeff Dowell, LG Electronics’ vice-president digital signage in Chicago, about this strategic partnership and more. “Our partnership with BroadSign is a new and unique partnership strategy geared for fairly defined market segments,” says Dowell. It has always been LG Electronics’ modus operandi to work with various partners, and the electronics company did not want to disturb any of the strategic partnerships that are in progress. Further, a careful market segmentation is needed with its new product in order to ensure LG is not competing directly with smaller software providers. “The agreement with BroadSign is for all of North America, and SuperSign Premier, initially available in the U.S., will be sold in Canada in a few months and eventually in Mexico,” says Dowell. The SuperSign Premier is designed for distribution though distributors specifically for a market ranging from the one- or two-person ‘mom-and-pop’ store all the way to a 10 or 12 store operation in a localized market. These might be in retail, in independent or small chain quick service restaurants, in local financial firms such as savings-and-loan companies, and perhaps in corporate company lobbies or lunchrooms. “We differ from other companies targeting the SMB market because of the breadth and scope of the offering itself,” says Dowell. 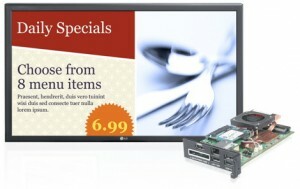 SuperSign Premier is LG’s turn-key digital signage solution, complete with compelling content offerings, technical support and convenient monthly financing that SMBs can use out of the box. 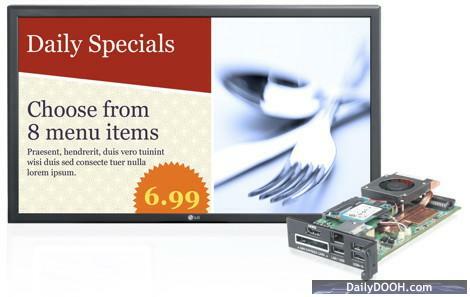 This digital signage solution includes a flat panel display and the NC2000 media player, which provides access to content management software and starter templates as well as news and weather feeds from CNN, all available at an affordable monthly cost of US$149. Digital signage content can be created simply using more than 50 starter templates that are customized for numerous vertical markets. In addition, SuperSign Premier includes a stock image library from iStockphoto, that offers easy, affordable and royalty-free photos, illustrations, video, audio and Flash files. And to keep content fresh and professional, users have direct access to LG’s ‘Certified Content Providers’ that offer custom content creation services for the SuperSign Premier system. The initial four of these are: Aspect Productions, Alchemy, Blue Pony and Saddle Ranch Productions. “But not everyone is looking for a pre-packaged solution,” says Dowell. So LG also offers the SuperSign Elite‬, made for the VAR/Integrator that wants a fully customized solution for their end user, and who has the ability to pull together all the necessary pieces and parts to create that solution (hardware, software, content creation, content management, newsfeeds, tech support, etc). The media player, when connected to a display, allows users to create dynamic content using pre-loaded templates for information sharing or displaying video segments in full HD. SuperSign Elite’s management software allows for quick navigation through menus to control networked displays and simultaneously run media files such as video, images, audio and flash. The SuperSign Premier can include various sizes or shapes of display. In addition to horizontal and vertical standards, for example, there are two sizes of stretch displays, longer and skinnier for banner applications. This entry was posted on Tuesday, November 23rd, 2010 at 09:23 @432 and is filed under DailyDOOH Update. You can follow any responses to this entry through the RSS 2.0 feed. You can leave a response, or trackback from your own site. And for those who would like an alternative software solution, we have been working with LG over the last few months and have created a signagelive upgrade for both the NC1000 and NC2000 players. For UK resellers and end-users the upgraded solution is available through http://www.medium.co.uk and for all other interested parties, contact me directly. Congratulations Jeff on a super initiative! More screens the better for the industry. It truly is the digital age isn’t it! For network owners who are looking to make money from National advertising on their networks, drop me a line. We’d be happy to have a look at your network and consider you to join the Adcentricity family.